Where do you keep your violin(s) when not practicing/playing? I might have to start monitoring our house. The replies are interesting and vary greatly. Right now, with Winter breaking, our humidity level is on the rise. The house has gone from the 20's into the 30-40's range, but that is still too dry. 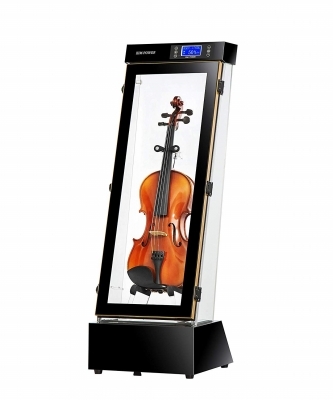 I imagine we'll now have a few months were the humidity level in our house will be more friendly to my violin, and I will be able to keep it out of the case and handy. Then, as Summer comes around, I'll have to monitor rising humidity levels, although with A/C our house is usually very comfortable, but I'm not sure of the humidity ranges. Right now, I keep my violin in the case with a Dampit. The case's built-in Fiddlerman hygrometer always reads between 50-55% humidity which is good. I'll see what Summer brings, but am definitely going to put Humidity Plan B (whatever that is going to be) into effect for next winter. This will probably be a larger, better whole-house humidifier. Not only will it allow me to keep my violin handy and happy, but it will benefit our skin and respiratory health as well. Moonshadows, we are in a similar boat. I'm south of you some in Lancaster County. I think you get a bit more snow in the Poconos. I had you confused with Greg W. who is in Tennessee. Weather changes fast around here doesn't it? One week there are flurries and the next week I'm looking at mowing my lawn. You're right about Spring coming around fast. Never a graceful entrance into Spring, more like a drop into Spring. MoonShadows I was attempting to give your post 5 stars and accidentally gave it two. I haven't been drinking either. Scary huh? Ah, same score I'm giving my practice session today today! I usually practice in the afternoons after I've finished everything for the day and feel relaxed. Today, since its going to be nice out, I want to go work in my greenhouse, and I always stay out there longer than I plan, so I am practicing early today, but I feel myself "rushing" and I can't seem to do anything right! I want to go work in my greenhouse, and I always stay out there longer than I plan, so I am practicing early today, but I feel myself "rushing" and I can't seem to do anything right! I guess, on this one, I'm just "lucky" ! Good question though, Jim, and helpful to many folks I would imagine ! Sounds like I need to move to Scotland so I can leave my fiddles out year-round. Hey @BillyG I think all of us "senior citizens" get up early. Myself, I get up at 3am. I like being up that early. It is quiet, no people, no phones, my time. I usually check the news, catch up on correspondence, check my forums and maybe do some writing as I enjoy my two cups of coffee. As I sit here now, the humidity level is 36%. You are fortunate not to have to deal with this issue. I image it would take quite a bit of time for a violin to develop a crack or open seam, but I just want to be on the safe side. I also wonder if the dry air affects the violin as to effect a change in it's sound, not that it would be that noticeable with my scratching. I also wonder if the dry air affects the violin as to effect a change in it's sound, not that it would be that noticeable with my scratching. That it does, for sure. It does it gradually, so you don't really notice it, until you get a wonderful humid day, which really changes the sound, they sound so much better. I've spoken to a few local musicians that say the same thing, guitarists and fiddlers. They love the sound they get on those days. Say it's like the wood opens up and sighs. In the Summer when a/c runs all the time humidity starts trending the other way and can get above 65 in the basement fiddle cave. Have to roll out the DEhumidifier. Probably FRET ⬅ (c what i did there) over it too much though. Raining heavily, a very typical March nor'easter, but at least the temperature is warm enough so it isn't snow. I just checked my room hygrometer and it is the first time the humidity is above 40% since the onset of Winter. Soon, I can leave my fiddle out. I guess if I won the lottery, I could spend $1499 on this...a showcase with constant humidity. HECK yeah! Now were talkin'! Rofl..
Looks really nice. Too nice for me.